Great excitement in the Sewelly polytunnel & garden as veggies are almost ready for harvesting! 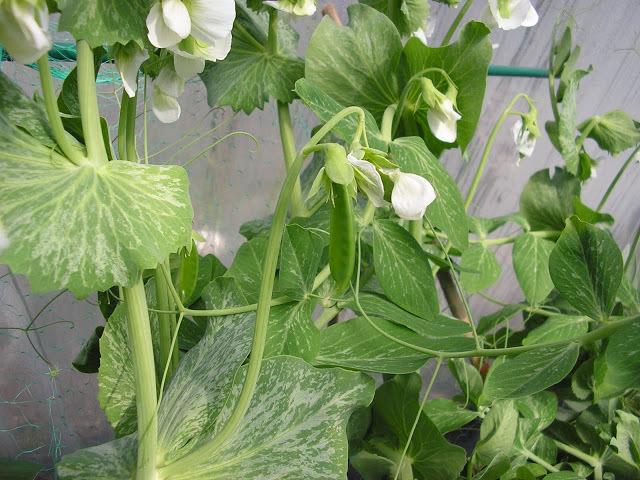 The peas and broad beans that were planted before Christmas are starting to appear so I’ll be digging out the recipe books soon as picking fresh produce always makes me want to try out a new dish. This early harvest will help to fill the ‘hungry gap’ when the only other fresh veg we have to eat at the moment is purple sprouting broccoli. I almost pulled it up after the snow as it was looking so downcast, but decided to give it a feed of fish, blood & bone and this is the result – five plants full of delicious florets (that were especially tasty in this evening’s stir fry). There are loads more tiny florets starting to appear beneath the large leaves in the next few days too. The plan this year is to keep the polytunnel as productive as possible so that it earns it’s keep! With that in mind we have shallots planted behind the peas & beans and the plan is to plant cucumbers once they’ve all been harvested. I haven’t quite cracked full productivity yet though as the bed waiting for the tomatoes is still empty, and there’s a big space where the courgette is slowly growing. My experiment of planting sweet corn early too hasn’t quite worked out – only three germinated (!) so I planted another packet last week in the hope that they’ll catch up soon now the temperatures are rising (there’s obviously a good reason why seed packets recommend a month for growing and late March wasn’t it). The french beans have all germinated and are starting to grow rapidly too. We never had much success growing these outdoors as it just never seemed warm enough so hopefully will have better luck inside this year. Meanwhile outside the strawberries are showing signs of flowering and the Red Duke of York first early potatoes are coming along nicely too.